•State & district Level world language leadership, state and regional cultural partners, university and college world language leadership and regional and state leadership involved in promoting and supporting international education and global workforce development. •An opportunity for world language & international education Leadership from across the state and region to learn from each other, network and spend time together! •An opportunity for leaders to receive Professional Development specifically related to your work! 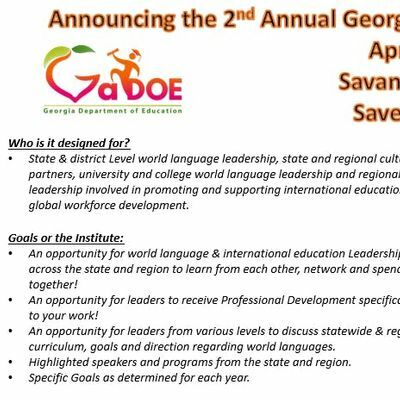 •An opportunity for leaders from various levels to discuss statewide & regional curriculum, goals and direction regarding world languages. •Highlighted speakers and programs from the state and region. •Specific Goals as determined for each year.